It was not long ago when everybody was talking about $200/barrel oil and $5/gallon gas and how the energy price could affect the economy, which is battling a possible recession, and consumers, who have already been strained by high cost of living these days. From food to health care to tuition, prices just kept going up and up. Then, all the sudden, after getting close to $150 a barrel in early July, the price of crude oil has started to fall and has fallen hard since the peak. 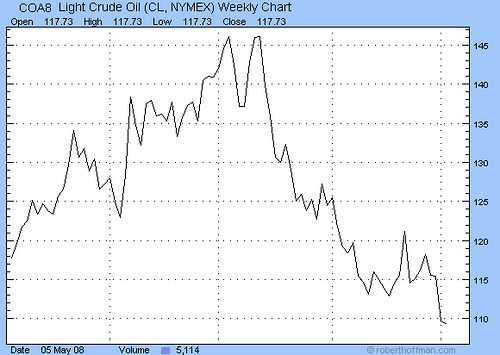 Now you can get a barrel of crude oil for under $110 (chart from tradingcharts.com). And as the oil price went down, so did the price of gold. Gold, and other precious metals, lost their appeal as a hedge against inflation (chart from goldprice.org). Not just oil and gold, though they are two major components, commodity prices in general have come quite a bit recently. At the same time, the U.S. dollar has reversed course against the Euro, rising to a six-month high at $1.45 per Euro as the economy in the Euro zone shows more signs of sliding into a recession than the U.S. economy does. During the commodity boom in the past year, many investments that bet heavily on natural resources had given investors stunning returns. For example, one of my mutual fund investments, CGM Focus Fund [[CGMFX]], returned nearly 80% in 2007. It was the best performing investment in my portfolio last year. Not so lucky so far this year though. The decline in oil price has brought down CGMFX a lot since July. Yesterday, hedge fund manager, Ospraie Management LLC, announced that it’s closing its flagship Ospraie Fund after the fund lost 27% in August alone and 38% YTD from investments in “energy, mining and natural resources equity holdings” (Reuters). The fund, which had $2.8 billion invested at the beginning of August, had an average annual return of 15% through the end of 2007 (Bloomberg). Past performance indeed doesn’t guarantee future returns. Do you have any investments in commodities? How are they doing now?